Perfectly fitted motorcycle jacket with classic 60s styling | FIM-210NOCZ Soft naked cowhide Three outside pockets Two vertical front vents &nbs..
Hipster | LM-FIM253Lightweight distressed sheepskinSingle snap mandarin collarVented zipper chest pocketsGrommets under each armTwo zippered slash pocketsZipper on each sleevePermanent mesh linerPerforated action backFull sleeve, zip-out, insulated thermal linerArmor pockets for CE1 rated inserts.. 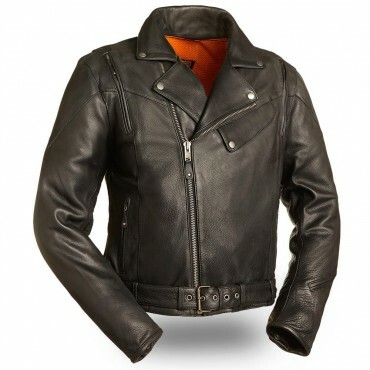 This heavy-duty jacket offers great functional features for anyone to ride in style.Naked cow hidesSnap down lapel and collar Large zip front utility gun pocket Two large side pockets Zippered sleevesTwo side buckles Two zip arm vents Two concealed carry pockets Padded kidney belt for support Large back vent.. Mastermind | LM-FIM244Soft milled cowhideDual full length vented utility pockets, two additional front pockets, and two interior pockets for ultimate storage possibilitiesTwin full length vertical vents on backBuckled waist tabs for perfect fitAction back with stretch panels in arms for comfort fit while r..
Maverick(Tall) | LM-FIM262NTCZSoft naked cowhideModern fit, mandarin collar, stripe detailing, & hidden zippers for a sporty lookPerforated action back for look and air flowFull opening zippered sleeve cuffs, great fit, easy to put on and comfortable to wearSide zips at the bottom for more comfort while riding2 s..
Superstar | LM-FMM200Men's Classic MC JacketMilled cowhideBelted waist for traditional stylingQuilted liningGenerous cut..
Top Performer | LM-FIM288This is a very sporty scooter style jacket with lots of ventilation.Single snap mandarin collarPadded shoulder detailTwo vented chest pocketsTwo lower zip pocketsZipper vent on each sleevePadded elbow detail and kidney beltZipper on each sleeveTwo inner pocketsGrommets under each armSnap side tab F..
Trubine | LM-FIM213CNPComing Soon!Perforated naked cowhideSingle snap mandarin collarVented zipper chest pocketsGrommets under each armTwo bottom zipper pocketsZipper on each sleevePermanent mesh linerAction backArmor pockets for CE1 rated inserts ..